It is difficult to imagine the Wedding Banquet without the toastmaster. Toastmasters are invited to a wedding not to turn into a banal meal "drink - a snack" and to this day memorable for the newlyweds and all guests. 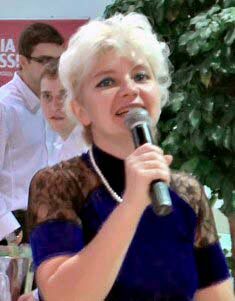 In Russia up to 90 years in the role of toastmaster speaking any of the guests or relatives. The will of fate, this role is often dropped out to me. As the "Witnesses" and voluntary "Toastmasters" I spent all of my friends wedding. Now this problem is solved by the people for whom holding weddings and other celebrations is a profession. Has not escaped this fate and I - something had to learn that something has come with experience. As toastmaster should not just keep the wedding painted on the script, but have a subtle psychologist, to feel when it's time to say a toast, and when to have fun contest ensure that no guest is not sad at the table. Although to be honest, I still believe that toaster - it's not a profession but a vocation. So, I spend weddings (mainly wedding banquets), that is, speaking in Russian I'm "Tamada". Тhe Russian word "Tamada" means more than the english word "toastmaster". "Tamada" - this is leading to the wedding, and toastmaster, and the organizer of the traditional wedding ceremonies, as well as entertaining quizzes, contests and dances. This text translated from Russian using Translate.Google. If you notice phraseological or grammatical errors in the text, please scroll to the fragments and send it to us using the dialog box. Nobody, except you do not know better, how you want your holiday. Together we can fulfill your wildest ideas and suggestions! Inquire in your wedding day there was a rain, do not be upset. On the contrary, connected with this very good sign: Your union will be "do not spill water, " the main thing that while there is rain in your relationship is not flashed not a single cloud.